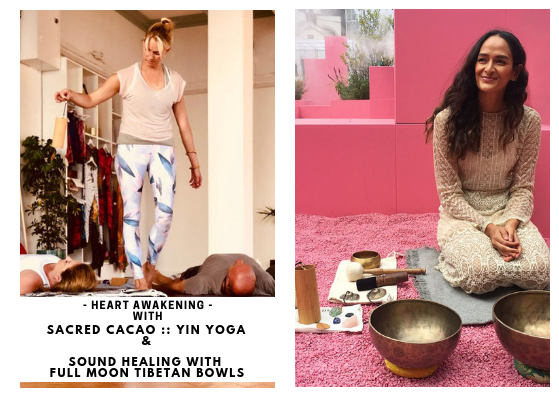 Guest Event: Cacao, Yin Yoga & Sound Healing with Full Moon Tibetan Bowls. Candice & Francesca warmly invite you to join us on the journey with Cacao, Yin Yoga & Sound Healing with Full Moon Tibetan Bowls. We will begin our journey mindfully, turning our attention inwards with a guided heart meditation to help us get clear and set our intentions for the journey into the heart. Unfortunately this workshop is not suitable for pregnant ladies, Epilepsy sufferers or anyone taking MAOI anti-depressants. Anyone on anti-depressants and heart conditions please contact us first. Booking is essential so please email francesca.secolonovo@yahoo.com to save your spot. · Please drink plenty of water the day before and day of ceremony. · No food directly before and have a light breakfast. · Bring an item for the alter if you wish. · Cacao works subtlety and the process can last for days, keep a journal of thoughts, feeling and dreams in the coming days. I personally have done very profound dream work with cacao. · Certain anti-depressants are contra-indicated with the tyramine in cacao, so we recommend checking your meds first. MAOI based anti-depressants are contra-indicated with chocolate, so a larger dose of cacao is not recommended. MAOI based anti-depressants are first generation anti-depressants and are less common these days. People taking them are on a restricted diet that includes limiting or avoiding chocolate, so they should know if they can consume or not. Side effects could include more serious headache and nausea, so make sure to check medications first. · Serious heart conditions. The theobromine in cacao increases heart rate significantly and is a vasodilator, lowering blood pressure. If you have such a condition, consider consulting a physician and certainly go lighter on amounts. · Pregnancy & breastfeeding. Like coffee or tea, it is important to reduce the intake of stimulating foods. The theobromine in cacao, which is very similar to caffeine, has a stimulating effect. Thus we recommend using lower dosages (ex. a maximum of 1oz in a ceremonial drink). Sold Out: Yoga, Embodiment & Live Music ~ Inc superfood lattes.